Place wonton wrappers in muffin tin and cook at 350 degrees until golden brown. Remove and repeat for desired amount. In a medium bowl cream together the cream cheese, garlic, and blue cheese. Set aside. Remove chicken from bones and shred in a bowl, add buffalo sauce and toss. 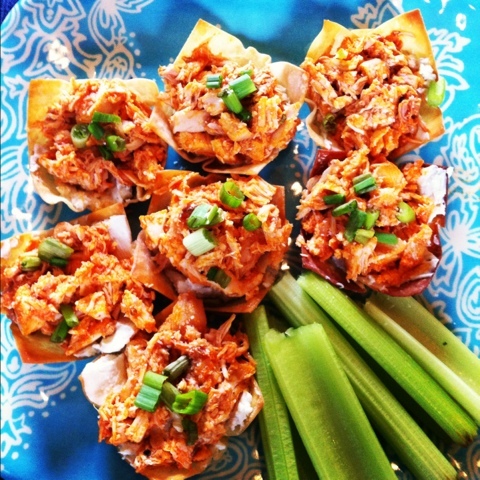 Put it all together… Spread the cream cheese mixture (about a tablespoon) in the bottom of each wonton cup. Place a heaping spoonful of the chicken mixture on top and garnish with chives. Can be severed with celery. Enjoy!